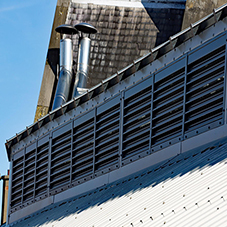 McKenzie Martins roof-mounted ventilators and side wall louvres provide natural ventilation for industrial and commercial buildings. Roof ventilators: Mackridge (ridge-mounted) are manufactured to accommodate any roof pitch, suitable for mounting individually or continuously. Kenstack (slope-mounted) are mounted to suit roof purlin spacings with a base to suit any profile of roof sheeting. Options for both units include dampers (controlled manually, pneumatically or electrically) and bird guards, and are available in a choice of materials and finishes. Louvres: A range of fabricated louvres is available including fixed box, operating, insulated, and acoustic. All tailor-made to requirements, options include bird guards, fly mesh and security guard. Maximair architectural extruded louvre systems are offered as fixed-blade, providing areas of any length or height for continuous unbroken louvred fascia. Mitred corners, curves and unusual shapes are available, as required. See separate entry under Louvres. Roof-mounted natural/fire ventilators: Clearfire 2000 louvred fire/smoke ventilator. Firemac 2000 single- or double-flap fire/smoke ventilator. Rooflights: Ventura rooflight range. See separate entry under Rooflights.